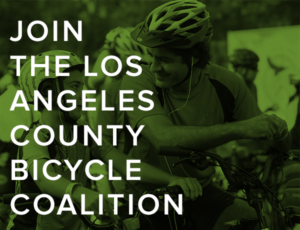 The LACBC has extended the deadline to apply for the Executive Director position (pdf). If you think you’re up to the challenge of leading one of the nation’s most vibrant and innovative bike advocacy organizations — or know someone who is — you’ve got just a few more weeks to apply. The League of American Bicyclists has decided not to actively support Cherokee Schill, the Kentucky cyclist arrested for the crime of riding her bike in the traffic lane. After analyzing the unique qualities of the state’s antiquated traffic laws, they determined that an argument could be made either way. And since it doesn’t have national implications, they’d rather work to change the law than help fight in court for her right to ride. Their reasoning makes perfect sense. But I can’t help thinking they’re leaving her alone to face the legal lions, when they could easily step in to lend a hand. Because moral support ain’t worth a damn on the streets. Or in the courts. 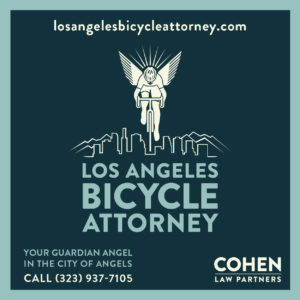 The lawyer for the South LA bike rider allegedly beaten by police offers his side of the story. Bicycling magazine describes the merits of bike-friendly city #28 on their list, also known as the City of Angels. Santa Monica College is the first California community college to be designated a Bicycle Friendly University. California’s own — and now America’s only — Tour de France winner moves forward after 12 years of hell for taking a stand against doping in the peloton. Laguna Beach riders get a new, continuous north-south route that avoids dangerous PCH. The Newport Beach City Council is scheduled to vote on adopting the city’s new Bicycle Master Plan on Tuesday night. Meanwhile, friends and family come to the support of the wife of fallen cyclist Shaun Eagleson, who was killed by a hit-and-run driver in Newport Beach last week. A teenage bike rider may have suffered serious head trauma when he was hit by a car in Phelan in San Bernardino County. An estimated 10,000 people turn out for Santa Barbara’s second annual open streets event. The Department of Fish and Wildlife is going to the mattresses to stop scofflaw off-road riders in the Burton Mesa Ecological Reserve; thanks to Megan Lynch for the heads-up. Mountain bikers compete in a 24-hour endurance race in Oroville. Bicycling is the new wonder drug. A new smart bike helmet promises to beam data on your heart rate, calories and performance to your cell phone. Corvallis OR police are puzzled by a 100% increase in bike thefts over last year. A Springfield MO man gets seven years in the death of a cyclist who was killed as the man’s girlfriend attempted to flee from him as he chased her through the streets of the town in a stolen car after flashing a gun. Sounds like he got off way too easy. A Clarksville TN mountain biker wanted a challenging trail to ride, so he built one. Then got hired by the city to build more. A Chicago cyclist is critically injured when he’s hit by a stolen semi-truck; the driver is arrested after fleeing the scene. New York’s financially troubled Citi Bike is purchased by a real estate company that owns other bike share programs in North America and Australia. I want to be like him when I grow up. A 76-year old UK track cyclist sets a world’s record in the over 75 class. The Afghan Women’s National Cycling Team has Olympic dreams, despite the difficulties facing women — let alone women cyclists — in their home country. Nearly 50% of Aussies would bike to work if they received financial incentives to do it. Evidently, cyclists in Singapore face the same anti-bike clichés as riders in the US. And everywhere else, apparently. If spandex impacts cyclists’ ability to observe stop signs, then it must affect drivers as well, since 80% of today’s clothes contain at least some of the material. No, seriously, when a highway patrol officer tells you to move your bike, don’t threaten him with a knife. And in a brilliant idea, Edinburgh, Scotland bans cars from school zones in an attempt to improve safety, something that would undoubtedly cause parental rioting here. An Olympia WA man gets work-release despite his seventh — yes, seventh — DUI arrest; he’ll spend nights and weekends in jail, but be released every day to run his business. Odd that they don’t offer bank robbers and drug dealers the same consideration. And no word on how he plans to get there; let’s hope he won’t be driving. And an Illinois lawmaker proposes a new bill to help keep more drunks on the road. Because it’s too inconvenient for them to find some other way to get around without killing someone. Vox provides their own analysis of the report. A moving new documentary profiles Damian Kevitt and Ghost Bikes LA to call attention to the dangers cyclists face, especially from hit-and-run drivers. At only eight minutes long, it’s definitely worth watching. Streetsblog looks at Temple City’s new partially protected bike lane on Rosemead Blvd. Both Milestone Rides and Boyonabike offer reviews of last week’s LA Bike Week, most of which I missed. Santa Monica considers dropping speed limits to 15 mph near schools; then again, it doesn’t matter what the speed limit is if they don’t adequately enforce it. Downey is preparing a new citywide bicycle master plan. They’d better hurry, as a bike rider was seriously injured attempting to cross a freeway onramp early Thursday morning. Redlands gets a new Community Based Bicycle Master Plan, which will provide 175 miles of bikeways — a huge amount for a town of just 69,000. And a local market plans their own privately operated bike share program. A new company plans to provide bike camping around San Luis Obispo. Specialized finally puts their wind tunnel to good use by determining the aerodynamics of beards on bikes. Now if they’d just figure out if shaving your legs really makes you faster. According to Forbes, American bicyclists save $4.6 billion a year by riding instead of driving; I’d like mine in cash, please. Meanwhile, Intuit explains just how that works. A Grist writer says Idaho Stop laws infringe on pedestrians’ right-of-way; actually, cyclists are still required to yield to anyone with the right-of-way. Brooklyn Spoke says the subject is complicated. Chicago drivers — including city bus drivers — are turning a buffered bike lane into their own traffic bypass lane. The NYPD is back to ticketing cyclists in Central Park. The US Pro National Championships roll in Chattanooga this Monday. 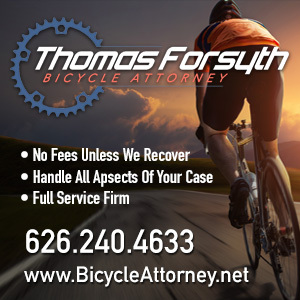 A Virginia lawyer offers advice on the eight things you should do right away if you’ve been injured in a bike collision. Seriously, though, you’d think an attorney would know not to call them accidents. An Ottawa writer says the city doesn’t need any more bike lanes because they can’t make the climate bike friendly. Oddly, he doesn’t suggest they stop building roads due to adverse winter driving conditions. Four hundred London cyclists stage a die-in at a notoriously dangerous intersection. Liverpool plans to triple the number of cyclists who ride at least once a week. A Melbourne bike rider is injured when she crashes into a police vehicle hidden by a blind curve on a bike path. The cops were targeting motorbikes and other motorized vehicles illegally using the trail, like… uh, them. Aussie cyclists protest the country’s mandatory helmet law; ridership in Tel Aviv jumped 54% in just two years after the Israeli city revoked theirs. Even Chinese robots can track stand, so why the hell can’t I? A road-raging New Hampshire bike rider shatters a driver’s passenger window, then takes his anger out on a nearby construction worker; no matter how angry you get, acting on it only makes things worse. A PA man posts a thank you for the man who stole his bike. And three young cyclists are arrested for speeding at a blistering 10 mph. The Memorial Day weekend means heavy traffic this afternoon as people get off work early and rush to get home and get out of town. So ride defensively and watch out for drivers today, because chances are, they won’t be watching for you. I expect to see you all back here safe and sound on Tuesday. We’ll ignore the fact the Orange County is, well, a county. Not a city. Or if you prefer, a lot of cities, even if they do tend to blend into one another at times. But O.C. and L.A. have made the League of American Bicyclists list of Bike Friendly Cities, if only just barely. Both were named Honorable Mention, a step below the Bronze designation, in recognition of the steps each has made. And just how far they have to go. Los Angeles makes its claim on the basis of the new-found support from City Hall that has resulted in a widely praised new bike plan — which is just starting to result in new paint on the street — as well as the groundbreaking bicyclists’ anti-harassment ordinance. But as Bikeside’s recent survey suggests, local cyclists face far too many unfriendly streets and drivers to deserve a higher ranking; I would read this more as recognition of the possibilities, rather than what’s already been accomplished. Sort of like Obama’s Nobel Peace Prize. And I’ll let you decide how that’s turned out. If — and it’s a big if — the city manages to stay on course, it may legitimately deserve a bronze designation next year. Meanwhile, someone else who actually rides there will have to address whether the collection of cities and towns behind the Orange Curtain deserves its designation. There seems to be an unfortunate tendency to blame rude and scofflaw cyclists for the county’s unacceptably high fatality rate, including a crackdown on the victims — even though the overwhelming majority of Orange County fatalities have been the result of careless, drunk or distracted drivers, rather than lawbreaking riders. And at least one OC city seem to have an inexplicable fear of sharrows. But there must be progress being made; Irvine and Huntington Beach have already made the list as Bronze level cities, joining northern neighbors Long Beach and Santa Monica. And even though SaMo’s designation was widely derided at the time — including by yours truly — they seem to be making every effort to live up to it now. So maybe there’s real hope for L.A. and O.C., after all. We’ll just have to wait a few years and see. Biking goes haute couture; I discovered this bike in the Fendi store on Rodeo Drive during Thursday's Fashion's Night Out. Go ahead and text while you ride. Remarkably, Governor Brown vetoes a measure that would have increased fines for the nearly universally ignored law banning the use of handheld cell phones, as well as banning handheld use while biking. Brown explained his decision to kill the bill on Wednesday in a brief letter: “I am returning Senate Bill 28 without my signature. I certainly support discouraging cell phone use while driving a car, but not ratcheting up the penalties as prescribed by this bill. I think the governor needs to get out of the office more. By my count — and yes, I have counted — anywhere from 25% to 50% of drivers appear to be using a handheld phone at any given time. Brown vetoed a very good and very needed, law. Which doesn’t give me a lot of confidence regarding his support of the newly passed three-foot passing law. However, it seems the legislature may try to override his veto. Maybe that’s something the GOP members can get behind, if only to embarrass our Democratic governor. The League of American Bicyclists begins the I Bike I Vote campaign to save federal funding for cycling projects from a GOP-led effort to eliminate all Transportation Enhancements. You’re urged to contact your Senator today; you can download your own IBIV graphic here. Hopefully they can resist the right’s mad dash rush to return to the transportation policies of the 1950s. Another two bike thieves are behind bars; the Santa Monica Mirror shows a little levity in describing the situation police found when they were called to the Santa Monica Place mall. When they arrived at the scene the officers spoke with the security personnel who told them that they had observed two men who had been using bolt cutters to cut bicycle locks. This sparked the interest of the security personnel because they evidently knew that typically owners of bicycles do not do this. Then again, make that three bike thieves. This is why you always see a doctor after a cycling collision. A Memphis cyclist dies after riding home following a collision and telling his girlfriend not to call for medical help; charges won’t be filed against the driver who tried to render aid but was chased off by the rider. If someone ever asks if you want an ambulance following a collision, the answer is yes. Insurance should pay for it — yours or the drivers; regardless, your life is worth it. If I’d followed my instincts and ridden home after the Infamous Beachfront Bee Encounter, I probably wouldn’t be here today. Fortunately, the EMTs insisted I go to the ER, where they found a massive hematoma on my hip that could have bled out if I’d tried to ride home. And yes, I’m grateful as hell. Streetsblog says the 7th Street bike lanes are now officially open; LACBC offers photos of the press conference. The Times seems amazed that a car lane on 7th is removed in favor of bikes, while KPCC asks if the city is doing what it should to support cyclists and bikeways. And Dave Moulton uses the road diet as an example to ask if more lanes really move more traffic. The L.A. firefighters biking across the country to honor victims of 9/11 should have arrived Friday. How about Safe Routes to Universities, too? Nate Baird clarifies LADOT’s confusing stats on bikeway installation. L.A. Eastside visits the new bike lanes on 1st Street in Boyle Heights. Bike friendly City Council President Eric Garcetti announces his candidacy for mayor. The Times looks at the Bicycle Film Festival on now; Flying Pigeon will be there with select children’s and cargo bikes available at a discount. Rick Risemberg says it’s time for Beverly Hills to reach beyond the low-hanging fruit. Beverly Hills Patch looks at last week’s meeting to make the city more bike friendly, which could start with bike parking if they’d stop saying no. Why the beachfront bike path is named after Marvin Braude. Slow progress for cyclists and pedestrians in Malibu. Santa Monica lays out an ambitious implementation plan to become a bike friendly city. Streetsblog examines the unique arrangement that resulted in Glendale’s Safe and Healthy Streets program, including the planned Riverdale-Maple Greenway. A bike-riding gunman robs a Glendale woman. A Glendora cyclist suffers life-threatening injuries when he’s hit by a car; no other details are currently available. KPCC offers a great video of cycling the Angeles Crest Highway. Long Beach’s biking expats discuss trading Long Haul Truckers to tour by Brompton. 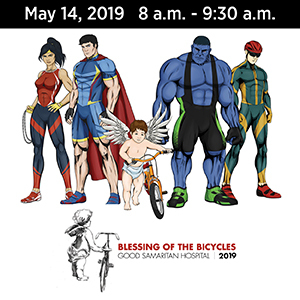 Thousand Oaks cyclists ride to raise money for the Make-A-Wish Foundation. A Santa Maria cyclist is stabbed in a robbery attempt. Santa Paula cyclists are about to get a new three-mile bike trail. Chico State students protest police citations for illegal bike parking at the same time bike racks are being removed. A Bakersfield teenager is critically injured after being hit by two cars while riding in the wrong direction. Tahoe cyclists are identified as a “major problem” because they’re the victims of a large part of injury collisions; next, South Tahoe police will target local deer because they keep getting shot by hunters. The cyclist nearly killed in a collision during last year’s Sonoma County Gran Fondo is nearly ready to ride again, almost a year later. Help Kickstart A Day in the Life with Vegan Athletes. Urbana’s industrial-strength rear rack is now available for all cyclists. A writer for the New York Times considers the lessons learned riding across the West; thanks to George Wolfberg for the heads-up. Thanks to an article in the Economist, a spotlight shines on Seattle’s hazardous conditions for cyclists. Durango CO cyclists need to observe the law; you know, so they don’t offend all those drivers who don’t, either. An Idaho driver is scared to death after hitting a cyclist who must have been right in front of him; just imagine how the rider must have felt. The Missoula cyclist found dead on the sidewalk apparently died of internal bleeding after crashing his bike and hitting his chest on the handlebars. The widow of a cyclist is forced to pay court costs as a jury blames her husband for the driver’s left cross that killed him. A Milwaukee driver claims he blacked out before his car drifted across the road to hit a salmon cyclist riding in the same direction in the wrong side of the road; police say a search warrant for cell phone use is standard procedure in such cases, which should be the case everywhere. A ghost bike is reinstalled after residents complain about its removal. Using GPS data to fill in the blanks following a crash. Courtesy of Carlton Reid, British researchers say if you want to grow cycling, ignore existing riders and focus on people who don’t ride; interesting advice, but isn’t that how we got the crappy infrastructure we have now? A UK cyclist dies when a fly flew into his eye while riding at high speed; a tragic reminder to always wear shatter-proof glasses when you ride. A minor lapse in judgment, another dead cyclist. The problem in Copenhagen is too many cyclists. Magnesium frames make a comeback; hopefully these will withstand exposure to oxygen, which seems to be almost everywhere these days. Say it ain’t so, Jeannie — one of the greatest cyclists of all time faces a ban for dodging doping tests. The Leopard-Trek – Team RadioShack merger doesn’t seem to be going so well. Hong Kong police start an educational campaign prior to a crackdown on scofflaw cyclists. An Indian cyclist dies in a freak collision with two motorcycles. Finally, a UK cyclist is beaten with a hammer by a motorist for riding too slowly up a hill into the wind; a police spokesman calls it a “massive over-reaction.” And a DC cyclist is intentionally hit by a driver for the crime of riding in the street. Evidently, human compassion sometimes skips a generation. And I notice the L.A. Weekly’s blatant misrepresentation of the new bicycle anti-harassment ordinance is still online, and still hasn’t been corrected despite a number of people repeatedly pointing out their error. I guess journalistic integrity skips a generation, too.